Photo: Danny Berger is one of five players from this past season’s rotation who look to take an increased role next year. Photo credit Mike Johnson. Utah State’s Kyisean Reed didn’t wait long to get to work after re-entering his team’s March 28 CollegeInsider.com Tournament championship game against Mercer. Stepping back onto the floor with just more than seven minutes remaining, the 6-foot-6 forward took a low-post dish from point guard Brockeith Pane, scooted farther into the lane and made an emphatic flush, cutting the Aggies’ deficit to three with 7:02 left. An alley-oop and a 12-foot flying slam less than two minutes later gave USU its first lead since the 13:48 mark of the first half and caused the crowd of the Dee Glen Smith Spectrum to get as loud as it had been all season. Despite efforts to emphasize a strong finish to the season, the Aggies couldn’t hold the advantage long enough to claim the tournament title. USU’s 70-67 loss to the Bears, their fifth at the Spectrum for the season, represented a theme that existed throughout the season: close, but one step behind most of the teams who have represented the program USU coach Stew Morrill has strengthened in 14 years on the job. Indeed, USU finished the year winning seven of their last eight games, without question their best stretch of the season. 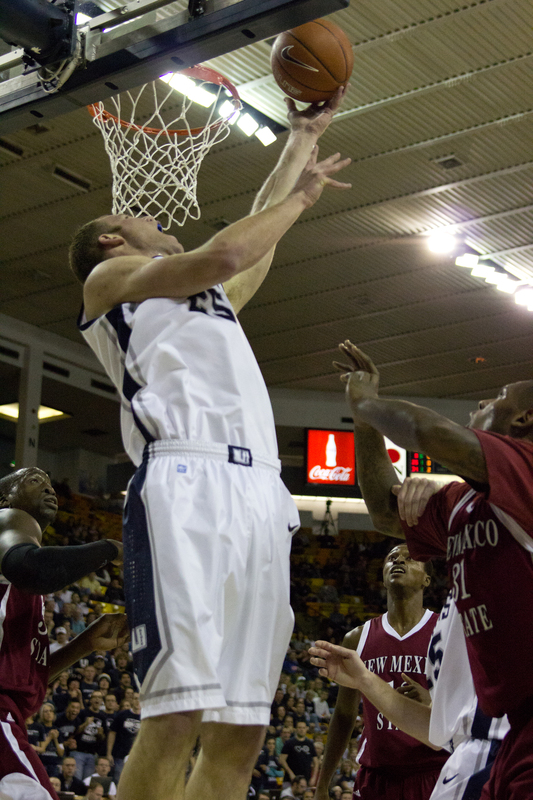 It finally marked a period of the season where the Aggies were able to gel after trying to manage 11 newcomers to the roster, a major shift after losing six seniors the previous season and seeing star forward Brady Jardine get sidelined in the third regular-season game, a foot injury that later proved to end his career. Fans may have thought they were going to see a version close to the teams that had won three straight WAC titles when the Aggies won four consecutive contests in mid-December, including a 19-point victory over fellow postseason contestant Kent State to climb to 8-5 heading into a New Year’s Eve showdown at nationally-ranked Mississippi State. A Danny Berger three-point attempt off the front iron was all that kept USU from startling the NCAA and adding a win over the Bulldogs to a trio of impressive victories that would have included BYU heading into WAC play. Unfortunately, things weren’t all good for just one contest between the Aggies’ strong regular-season finish and their stellar play in the CIT. By finding themselves matched against Louisiana Tech in the opener of the WAC Tournament, USU was facing a team that had won five of its past six games before advancing to the tournament final after beating WAC champion Nevada. Morrill acknowledged that the Bulldogs’ “tremendous athletes” were too much for a team whose own high-flyer, Reed, shot just 1-of-5 from the field and battled foul trouble. Reed’s play went a long way towards determining how the Aggies fared on a game-by-game basis. “There’s been many times where we’ve gone as Kyisean has been able to get loose for a while,” Morrill said in mid-February, after a 20-point, nine-rebound effort from the junior lifted USU to a league win. A member of the WAC all-newcomer team, Reed bounced back to average 12 points, 5.8 rebounds and nearly two blocks per game—all marks about his season averages—during the five-game CIT in helping the Aggies reach the playoff’s title game. Medlin said the run had could be attributed to more than the spark of certain X-factors, however. Reed is part of a large cast of players who—unlike last year—will be returning next season, seeking to use the CIT success as a springboard to greater accomplishments. True to the Morrill system, the Aggies won’t be void of help from junior college transfers, either. Outside of becoming a better leader, Medlin said Morrill most looks forward to seeing him improve his on-ball defense—something that plagued many USU guards, which exposed the small USU front line. Meanwhile, wingman Berger and center Jordan Stone are two players who were not fully expected to play this season but are expected to return to the floor. Ben Clifford will look to build on his 16.8 minutes per game for his sophomore season, where he averaged 4.4 points and 3.5 rebounds per game. Wing players like Mitch Bruneel and Adam Thoseby will be challenged by high-honored junior college transfers Spencer Butterfield, Marvin Jean and TeNale Roland. Butterfield, a 6-foot-3 guard from Loomis, Calif., was named the California Junior College Co-Player of the Year after leading Yuba Community College to the title game of the California Community College Athletic Association State Championships. TeNale Roland, a 6-foot-1 guard from Louisville, Ky., earned National Junior College Athletic Association Division II second-team All-American honors this past year at Rend Lake (Ill.) College. Overall, Roland becomes the fifth junior college All-American to sign with Utah State underMorrill, joining oft-injured Antonio Bumpus (Harcum CC) and all-conference performers Jared Quayle (Western Wyoming CC), Gary Wilkinson (Salt Lake CC) and Chaz Spicer (Kankakee CC). Though Medlin said that Morrill asked him to place focus in the offseason on playing the point guard position, Roland figures to play a role like Pane or Quayle did in taking the floor general reins from the outset of the fall, particularly since junior E.J. Farris will not be returning. With five regulars to the rotation returning in the fall, one may question where the main source of leadership will derive. For Medlin and Berger, their hands have gone up. Indeed, with the return of all-conference forward Tyrone Watson and a talented arsenal of guards, the southern Aggies figure to be with Nevada in the decision process for the pre-season WAC first-place finisher. Though the Aggies likely won’t be a pre-season top pick in either the coaches or media poll for the first time in five years—something Medlin said he was well-aware of—that isn’t a problem with him.